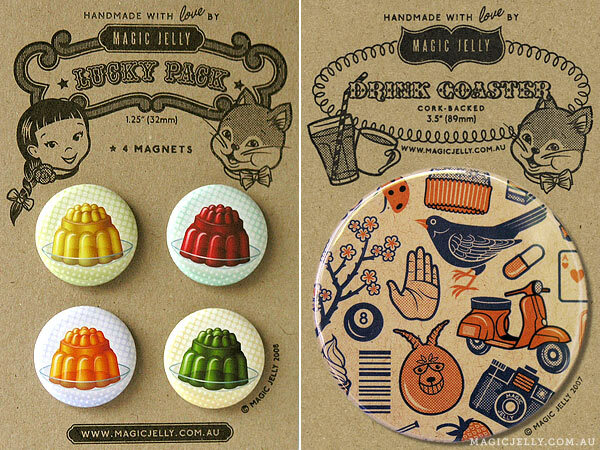 FK chats to super talented artist Karena behind label Magic Jelly, who is the artist behind our new Melbourne AW12 Markets flyer. How would you describe the style of your work? I think of my work as a blend of opposites – modern and nostalgic, cheerful and melancholy – that is expressed by using digital along with more traditional, low-tech media. I try not to feel defined by a particular style because I want to be free to take my work where ever I want it to go. It’s difficult to be objective about the style of your own work when you’re so close to it. Hearing about what other people see in it is far more interesting! What is your background and what made you follow a creative path? I didn’t jump straight into a career as an artist, I started off as a public servant, but was always painting and drawing in my spare time and sold some of my work here and there. I finally resigned and headed to art school, where I majored in Digital Imaging and Printmaking, but it wasn’t really for me, so I eventually left; I’m mainly self-taught. I always wanted to make a living as an artist, but wasn’t quite sure how to achieve it in practical terms. Thankfully, the internet has made a career as an independent artist a lot more accessible. When I’m making things, I feel totally contented and at one with the world – no other occupation has given me that sense of fulfillment. It isn’t the easiest or most lucrative career choice, but it sure is fun! Everything starts with pencil and paper. Then there’s Photoshop, Illustrator, Gocco, acrylic ink, dip pens, brushes, super-fine markers, vintage paper, scissors, a nice sharp blade and a metal ruler. Plus a hot cup of tea and some jazz on the radio. How has your creative style developed and what is your working process? 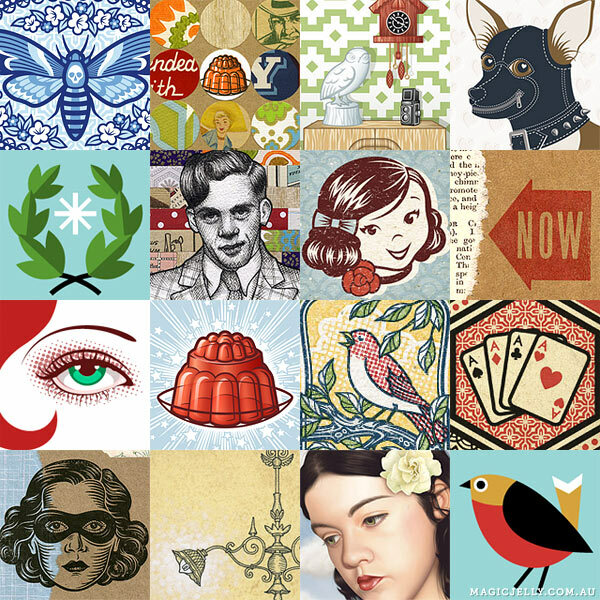 After leaving art college, I focused on working almost exclusively with Photoshop and Illustrator for about five years. I found that incredibly liberating because there’s so much scope for experimentation. I started to introduce natural textures and traditional media into my digital work as a way of adding depth and a more organic feel, and then found my way back to printmaking and collage. There’s not much that I do now that’s purely digital or traditional, part of my process is to move back and forth between the two. For example, I might start with a pencil sketch, digitally “ink” it, print it by hand with one of my Goccos (I have four of them! 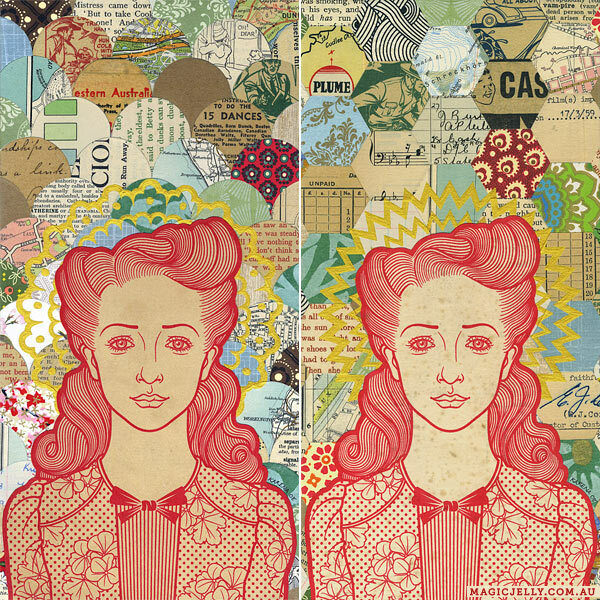 ), which then becomes part of a collage, that uses vintage ephemera hand-cut into a pattern I designed in Illustrator, that I then finish with some paint or ink. 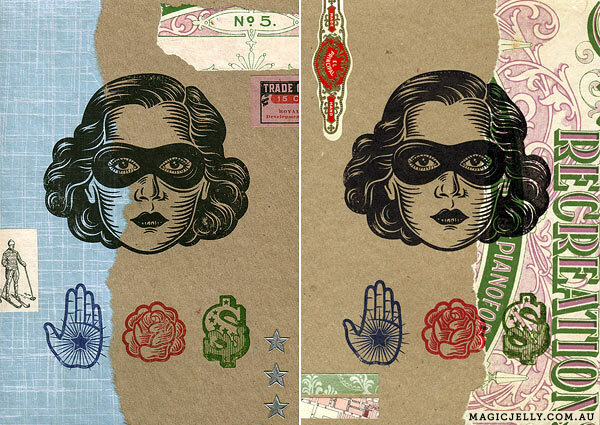 I also make my own polymer stamps, and occasionally tea-stain, hand-colour or distress my prints and collages. I just like to mix it all up to create depth and texture, and blur the lines between old and new. 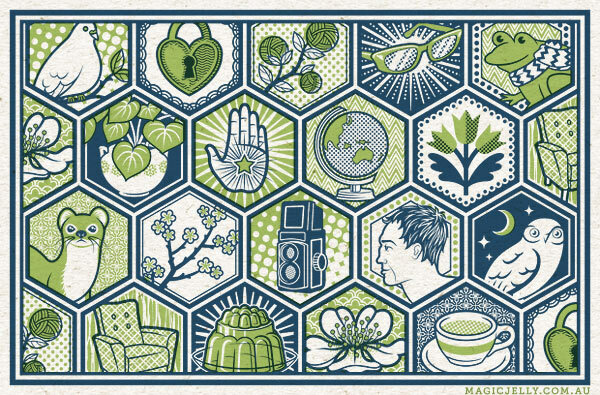 What inspires your work, and where do you look for inspiration? 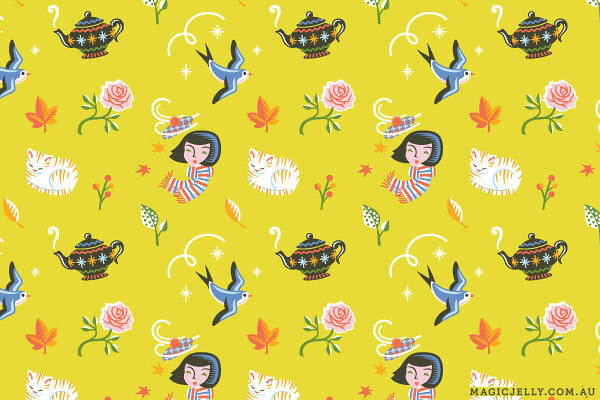 I still love the things that inspired me when I was a kid, such as mid-20th century children’s book illustration, comics, and vintage Chinese and Japanese packaging design. I love the cheap, pulpy paper old comics were printed on – the way the ink bleeds into it – the limited colour palettes, halftones and off-registration. That’s one of the reasons why I love Goccoing so much, it has the same kind of low-tech imperfection. I love vintage advertising and have an enormous collection of magazines from the early 20th century through to about 1960. Most of all, I think the best inspiration comes from the process of just doing the work and making mistakes. Some really good things have come from messing up royally. Inspiration is everywhere, so carrying a camera and notebook with you is essential! What do you love most about being an artist, and what are some challenges? What’s not to love about making a living drawing pictures? I get to make things every day! I love the independence and freedom; I can work to my own schedule, and often get to set my own projects, so there’s lots of variety. The downside is that it’s a solitary existence, working from home; I miss the social aspect of working in a big, bustling environment. I hope to do more shows and markets in future, meanwhile, it would be great to have some social interaction with other artists locally, but Adelaide is a little small and cliquey, and I’m rather shy when it comes to my work. But I do get to interact via my blog, as well as dealing with customers and clients one on one. People are very generous with their time, taking the trouble to send me lovely emails too – I find that kind of feedback and interaction invaluable. What has been your favourite project/collaboration to work on? My favourite project is usually the one I’m working on at the moment! An ongoing project has been setting up an online shop of my own. The shop design itself is finished, and I’m currently making things to put in it. I’m launching a range of jewellery and textiles, which is something new for me. I love designing on a small scale, so jewellery is a perfect fit, and it’s always exciting to find a new form or surface to print on. 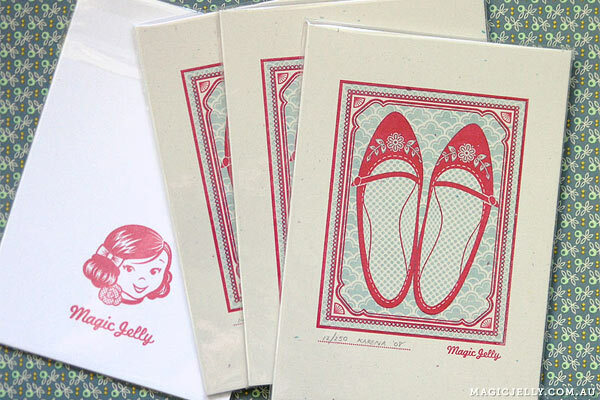 I have some new Gocco prints and collages I’m working on too. I can’t wait to launch! Any advice for illustrators starting out? My advice is to stay true to your vision. There’s nothing wrong with being influenced by the things you see around you, in fact it’s inevitable, but it’s important to find that balance between market trends and your own unique language. Also, if you’re working from home, make sure to schedule regular breaks. That might seem like really obvious advice, but it can be difficult tearing yourself away when you’re in “the zone”, but ultimately, you’ll be much more productive if you do! Thank you so much for conducting this interview. Karena is one of the artists that inspires me to start my art endeavor today and I’ve been look forward to hear her side of stories in starting her own. 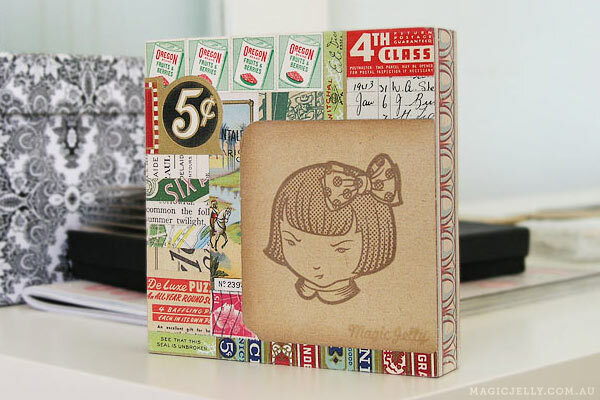 And she makes awesome collages and gocco pieces too, of course!